Low to medium shrub, 0.3-1.5 m tall; stems spindly, erect to spreading, usually bristly with numerous soft, straight prickles all about the same size, occasionally unarmed especially on younger stems, which are often stalked-glandular; mature stems greyish-brown. Alternate, deciduous, odd-pinnately compound, the leaf-stalk and axis somewhat stalked-glandular; leaflets 5, 7 or 9, elliptic, 1-4 cm long, double-toothed with gland-tipped teeth, otherwise smooth; stipules glandular and usually blunt-toothed. Inflorescence of usually single, occasionally 2 to 3, stalked flowers at the ends of lateral branchlets, the stalks bristly-glandular; corollas pale pink to rose, bowl- to saucer-shaped, small (2-3.5 cm across), the petals 5, 10-15 mm long; calyces 5-lobed, the lobes 5-12 mm long, egg-shaped to triangular tapering to a tail-like sharp tip, smooth or occasionally glandular on the back, deciduous; ovaries superior but enclosed in the urn-shaped floral tube (hypanthium); stamens numerous. Achenes, few to about 12, smooth except for a few long hairs at the tip, enclosed by the fleshy hypanthium, which ripens into an orange to scarlet, pear-shaped to ellipsoid hip 6-10 mm long, the neck and calyx-lobes deciduous. 1. Stipules entire to coarsely toothed; inflorescence single to several-flowered. 1a. Prickles strongly curved, stout; calyx-lobes often with conspicuous lateral segments and usually reflexed after flowering. 1a. Prickles not or slightly curved, often slender; calyx-lobes usually without lateral segments, usually ascending or erect after flowering. 3. Calyx-lobes persistent in fruit, greater than 12 mm long; petals greater than 15 mm long. 4. Stems with well-defined infrastipular prickles (pair of prickles at or just below each node) or nearly unarmed. 5. Calyx-lobes usually not glandular-bristly; leaflets coarsely toothed. 4. Stems more or less bristly with slender prickles; infrastipular prickles, if any, like the others. Dry to moist open forests, forest edges, thickets and clearings in the lowland and montane zones; common in S BC south of about 53oN; S to CA, MT and ID. A shade-tolerant/intolerant, submontane to subalpine, Western North American deciduous shrub distributed equally in the Pacific and Cordilleran regions. Occurs on very dry to moderately dry, nutrient-medium soils within boreal, temperate, and mesothermal climates; its occurrence decreases with increasing precipitation, latitude, and elevation. Common in open-canopy forests on water-shedding sites; persists on cutover areas. 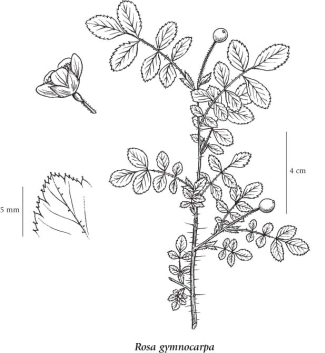 Usually associated with Gaultheria shallon, Kindbergia oregana, and Mahonia nervosa. Characteristic of moisture-deficient sites.